In 2015, I felt the draw to try backpacking for the first time. After bugging every friend I could think of who might be interested, I finally snagged someone to go with me. Erica and I were neighbors in vet school and we both loved hiking on the island where we lived at the time. Now she lives in Barboursville, VA, 20 minutes away from Shenandoah National Park and the Appalachian Trail. This was perfect. I had watched several documentaries on the Appalachian Trail (AT) and I was ready to tackle a small piece. That year I brought both border collies with me and we did a short 30-mile section hike over three days. It was a perfect first backpacking experience and despite being rained on for 24 hours straight the first day we had a great time. We finished and felt very accomplished. We also had minimal issues and saw zero bears, which was a relief but also a disappointment! When I felt the draw to get back on the AT this year, Erica must have felt it too because she texted me asking if I wanted to come down again. This time we were ready to branch out. 30 miles is nothing; let’s try 50 miles in 3 days! After all, we are no longer beginners: we are at least advanced beginners! Erica set the route, starting where we left off last time and hiking the south district of the park. 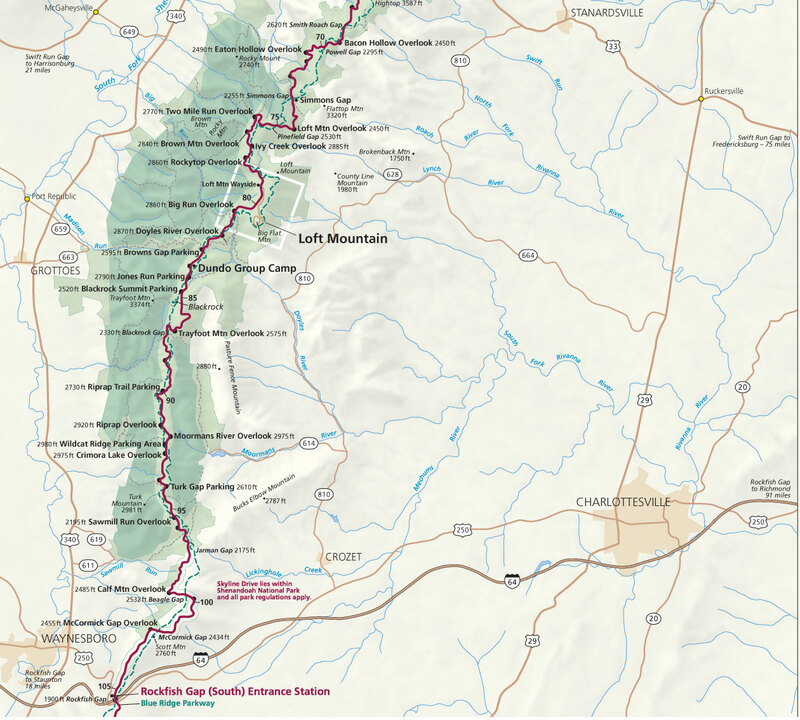 We would traverse about 20 miles of trail to the Loft Mountain Campground and have a night of luxury at a reserved site. We would then head out for another 20 miles to Calf Mountain shelter, which has a few tent sites but no luxuries like fire pits or camp stores. This was true backpacking. The real deal. We would then hike another eight to ten miles to the car on the last day. It was the perfect plan. A little ambitious maybe, but we could do it! We recruited two other players: one of my technicians (Sarah) and one of Erica’s friends and we set out excited and ready for adventure! My mother (a nurse of 30+ years and a worrier) bought me a can of bear spray in 2015 and made me promise to carry it on the hike. Annoyed, but also a good daughter I did so. After seeing zero bears that year I felt silly having carried this large can on a backpacking trip where unnecessary weight is your enemy. This year I almost did not bring the bear spray, but all I could think is: if I died from a bear attack and did not have the spray my mother would never forgive me. Once again I tossed the spray in my pack and promptly forgot about it. Black bears are very common on the AT and in Shenandoah. Erica has seen a few, as she hikes there often. Generally, you see them from a distance if you are lucky and they take off once they notice you. Day one started perfectly: perfect weather, perfect company, and Quinn was even being good on the trail. We were in the lead and he was pulling to go faster. Five miles in we were feeling great. The hike started with a steep two-mile trek up to Swift Run Overlook and we were rewarded with a beautiful vista! 18 miles left but we felt great. Three miles later, Quinn started acting a little off. He looked on edge, jumpy, and at one point he actually tried to turn around and pull backward. This is very unlike him. This dog is a border collie. He loves to hike and he will go for days. It was like he was saying “ABORT MOM, YOU FOOL! SOMETHING IS OUT THERE!” No one else was concerned. They chalked it up to his neurotic border collie tendencies, but I know my dog so I kept my eyes peeled expecting to see a bear or coyote or something. I coaxed him to keep going and like a good dog he did. With a look of “stupid human” on his face, we set off again. About ten steps later I saw it: a medium size black bear about 30 feet to our left, down in a small gorge. I pointed her out as she quickly ran off, with two tiny cubs bounding after her! It was amazing. Exactly what we were craving: NATURE! Quinn watched them run away and I could see his thought process connecting the bear smell to this fleeing animal, not as scary as he thought. Quinn’s I told you so look…. The rush of adrenaline wore off and it occurred to me that even though they ran away it could have turned out different. What if we were closer, What if Quinn had barked, or if she felt threatened? I decided maybe the bear spray should be somewhere more accessible, so I moved it to a side pocket so I could easily grab it. After all, we saw three bears in only five miles. Chances were high we would see more. About 18 miles in we were tired! When you are backpacking after a while everything hurts. Every step hurts, your pack hurts, the pull of Quinn’s leash hurts. You need to get into a zen state of walking and not think about the actual walking. This was my mindset when it happened. Quinn was acting normal this time. I was hoping he would become our “bear-dar” alerting us if another bear was near, but I think he must have also been in a zen state. Trudging along in a beautiful section with mature trees and the winding AT before us, a bear popped her head up about ten feet to my right. No joke, I was on top of this flipping bear! Before I knew it the spray was in my hand and I quietly warned the rest of the group. We started to back up. The bear seemed uninterested in us and thankfully Quinn was so tired he did not spot her. As we backed away another smaller bear (likely her cub from the last year) emerged on the path looking curiously at us. We backed away faster as to not get between a mother and her cub. Quick snap as I crept back down the path. Once out of sight of them we reeled. How AWESOME, so close to us! They did not run away (which was a little concerning) but we had the spray. We would just wait until they crossed and continue on, right? Only two more miles to the camp; we were so close. A few minutes later I handed Quinn off and crept up the path (bear spray in hand) to see if they were gone. I turned a bend and NOPE! There she was peeking at me from behind a tree. Her cub was eating something and mom looked at me as if to say, “sorry human, we found something yummy and you are out of luck. We are staying.” I snapped a quick picture at this point. After all, why not? She seemed calm and I crept back down the path. 20 minutes and several more checks later they were still there. Now what? No way we were going to try to pass by them. It was a Mom and cub, first of all. Second, they were at a food source. Last, Quinn was a bit of a wildcard and may lose it if he sees them. We contemplated clapping and making a lot of noise to scare them off but again, do we really want to provoke a momma bear? Finally, we decided the best course would be to backtrack a bit, hit skyline drive, and walk the road to the campgrounds. It would add two miles to the hike but it is better than upsetting a bear. After all, this is their home and we needed to respect that. Four miles later we hit camp. Two extra miles uphill were worth every bit of seeing those bears. Ticks are the worst. They were relentless on this trip. Poor Quinn, who had a very good tick control topical on (I mean, his mom is a vet) was picking them up left and right. Luckily, very few attached to him and those that did died quickly. The first night I woke up to four ticks crawling on me, seriously! I quietly freaked out and used my headlamp to check my sleeping bag to find several more. Luckily, they were not healthy. Having likely come from Quinn, they were delirious from the preventative and did not try to bite. Cursing my dog, I bathed in Deet and tried to sleep. The next morning I was done. Zero sleep, three more ticks in my sleeping bag, and multiple dead ticks around Quinn’s sleeping area. I could not imagine ever sleeping in the tent again. Physically, I felt good. Feet had minimal blisters and my back felt good, but the TICKS!! Erica being a good friend talked me off the ledge and we decided to trudge onward. Ticks or no ticks, we were going to finish this! Erica’s friend, however, was nursing an injured knee and decided to drop out at this point. Still not sure how I would ever sleep again, the three of us (and Quinn) headed out for day two. We got a little later start than planned, which was concerning. We had at least 20 miles to go, no guaranteed tent spot, and the AT through hikers to compete with at Calf Moutain. Lunch on day two was amazing. Eight miles in we stopped at Black Rock Overlook and the view is probably the best of the trip. We were feeling pretty good. The weather was perfect, no bears, tick count was at a minimum. We were going to make it! Several miles and one fast, long, uphill trudge later I was ready to pack it in again. 11 more miles seemed impossible and the ticks were still on my mind. Erica (being awesomely stubborn) talked me out of it. We decided to go the 6 miles to Turk Gap and see how we felt at that point before making any decisions. Our emergency exit plan involved calling her husband, Nate, to rescue us and eating some crow (which we did not look forward to). This part of the AT is one of the driest sections of the trail in Shenandoah and we trudged on. Going up a slow incline to Rip Rap overlook, we felt the heat. Unsure of the water availability at Calf Moutain we were trying to conserve, but it was not going well. Quinn was drinking a lot and I was not going to let him get dehydrated. Water was becoming a concern for our hike out on day three. Trail magic is becoming more and more common on the AT. It could be anything from people (trail angels) giving a backpacker a ride, to grilling burgers for hikers at a road crossing, to opening your house to let exhausted hikers take a shower and get a good nights sleep. There is some controversy on if this decreases the self-reliance experience of the AT or causes issues with wildlife. After only two days on the trail, a cooler full of cold drinks during a hot and dry upward climb was probably the greatest thing in the world. I can only imagine how a through hiker would feel after months on the trail eating oatmeal and drinking water. Yes, we took drinks. I still feel bad that we likely deprived a through hiker, but this was the best soda we ever had. Quinn greatly enjoyed his ice cubes! The couple also told us there was clean water available at Calf mountain, so our determination was renewed to make it there! The descent to Turk Gap was killer. I actually prefer going uphill. Downhill hurts your knees, your feet; everything hurts more! Once again, the call to quit was strong. Four miles left, dusk was upon us, thunder rumbled in the distance. If we even made it to Calf Moutain we would be setting up our tent in the dark, the rain, and possibly not even get a tent site so searching for a place with headlamps. Oh yes, the ticks were also a concern for me. Two miles up the trail, Sarah was in the lead setting a fast pace. She was about done with her crazy boss and her crazy hiking friend and their indecision! Quinn was pulling to get in the lead so we eventually passed Sarah. Dusk was hitting the trail. Everything looked darker and more ominous, and I just knew we were going to see another bear. With my bear sense tingling my eyes were already on alert, we turned a bend and there he was. A large male probably 20-30 feet in front of us crossing the path. I calmly said “bear” and we started backing up. This would have been no big deal, except for wildcard Quinn. Quinn was exhausted. Quinn was grumpy and I am pretty sure had been pondering putting himself up for adoption for the last five miles. Quinn saw the bear and decided he had enough: this bear was going down. As soon as he started barking, Mr. Bear became very curious and started walking towards us. My only thought was, “get Quinn out of eyesight of this bear! !” I pushed passed the others trying not to run hushing Quinn as I went and he quickly settled down thank goodness. The two miles back out of the woods took forever. I lead with the spray, Sarah had Quinn behind me, and Erica at the rear. Rational thought slowly returned and we decided hitchhiking to the car made more sense than making Nate drive all the way to the park. We called poor Nate back telling him not to come. He was pretty annoyed with us at this point, and also very unconcerned about our possible near death bear experience! We were picked up by a very nice man in a very small car who was kind enough to squeeze three very smelly humans, one tick-ridden dog, and all our gear in his two-door car. By the time we were driving home it was agreed that we could not have had a more epic ending, and that bear was the worst and the best thing that could have happened. The thought of spending the night in the woods was crazy. This is both terrifying and inspiring! I’ve been wanting to try backpacking for a while, and reading about your adventure makes me want to try it all the more. Glad you made it back safe! The photos are pretty amazing. You should definitely do it! Likely we were in minimal danger from the bears 🙂 If we did not have Quinn the last bear would have just kept moving along!